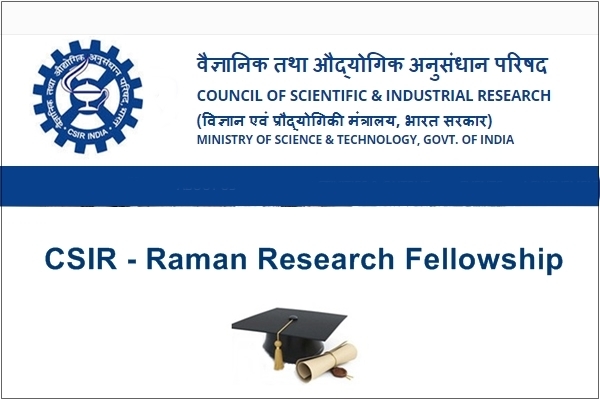 Council of Scientific and Industrial Research (CSIR), provides Raman Research Fellowships to the CSIR researchers for carrying out research in the emerging / high priority technology areas in reputed foreign institutions/R&D Centers of Excellence to enhance their R&D skills/capacity. The Fellowship is tenable abroad at CSIR cost. The Fellow shall be required to execute a bond before proceeding on Fellowship to serve the concerned institute for Three years on return from fellowship. Regular Scientists of CSIR with high academic qualifications (Post graduate in Engineering and PhD in Natural Science) and research experience, presently working in high priority areas, (FTT / Mission mode projects / NIMITLI projects / major programmes of Institute) who have completed minimum 5 years of service in CSIR on the last date for receipt of the applications. The applicant must have made commendable contribution to research/innovation in the proposed area, which should be of international lelvel. Fellowship should not be sought for training or to carry out tests, etc. using facilities in the host institute. The candidate should not be more than 45 year of age as on January of the current year. The selection will be made through a mechanism of interview by the duly constituted Selection Committee. The interviews will be held in CSIR HQs., New Delhi sometimes between March – June of current year. The exact date and time of the interview will be intimated to all the eligible candidates about one month in advance. The candidates are required to submit 6 (six) copies of their application form. In addition, an electronic copy of the nomination summary as per Annexure-III may be sent to the undersigned (kamlesh@sir.res.in).